Blog Quick Quotes: Summer Memories with Donna! 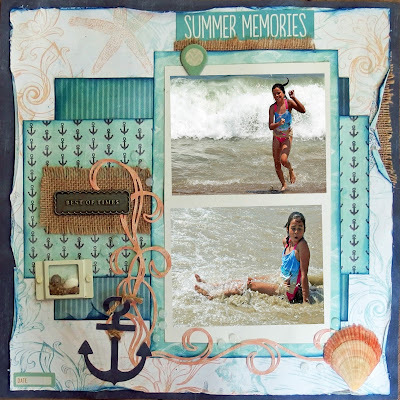 Hi Donna here today with a layout I did using Quick Quotes new line Anchors Away! In July we had the pleasure of taking our oldest granddaughter to the beach for a whole week. So much fun and so many memories, so this line is just perfect to scrap all your beach memories! The flourish and the anchor I cut from the Silhouette using Quick Quotes paper. I made a little "shadowbox" type embellishment. First I adhered the metal frame to then layout with a piece of paper in the background. Then I mixed tacky glue and sand from the beach until it had a pretty thick consistency and took a small spoon and carefully laid the sand on the bottom to make the "beach". Last I took a couple of tiny seashells we found and glued them on top of the sand. I loved how this turned out, and once the sand was dry it looked great! My enamel dots I made them by using Perler beads. There are tons of Youtubes out there on how to do this (just google it) but basically you take line up the Perler beads (this takes forever if you do them all at once!) on a baking tray lined with parchment paper and bake. Seashells, Sand, Making Memories Metal Frame, Perler Beads, Petaloo Fancy Trims, Echo Park Summer Sticker.